Boundary objects are material artifacts that mediate the relationship between two or more disparate perspectives. The concept of boundary objects has been demonstrably useful in a variety of research areas; however, the meaning and function of boundary objects is contested. At issue is the relationship between boundary objects that negotiate between perspectives and those that specify across perspectives. 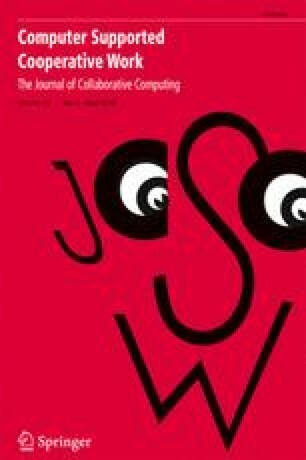 In this study the changing nature of boundary objects in cooperative work is related to the dynamics of evolving problem conceptualization, system design, and enactment within cooperative work settings. Design based research on material artifacts produced by an incipient cross-disciplinary research team during their efforts towards negotiating integrated conceptualizations and specifying shared research agendas is used to generate a more comprehensive model of boundary objects through the life of a project. This work was supported by National Science Foundation grant numbers 0636317 and 0753336 for the CI-Team Demonstration and Implementation Projects: Advancing Cyber-infrastructure Based Science Through Education, Training, and Mentoring of Science Communitie. The author gratefully acknowledges the many collaborators involved in these projects, whose comments and insights have been useful.